Rebel Metropolis | No More Excuses. 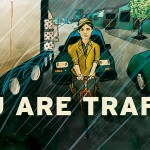 You Are Traffic. Not convinced? This should be easy to understand, but I appreciate your skepticism. Every gallon of gasoline burned to provide your cars’ movement creates about 25 pounds of carbon dioxide that goes straight to work trapping the excess solar energy that’s driving extreme weather and ocean acidification. Everybody’s whining and complaining that government won’t take bold action, well of course they aren’t, they need to make sure you have gasoline for your automobile! You’re going to take some personal responsibility and you’re going to make that bold action by waging a little revolution of one – you’re going to kill your car and you’re going to stop contributing to global warming as you travel about your fair city. 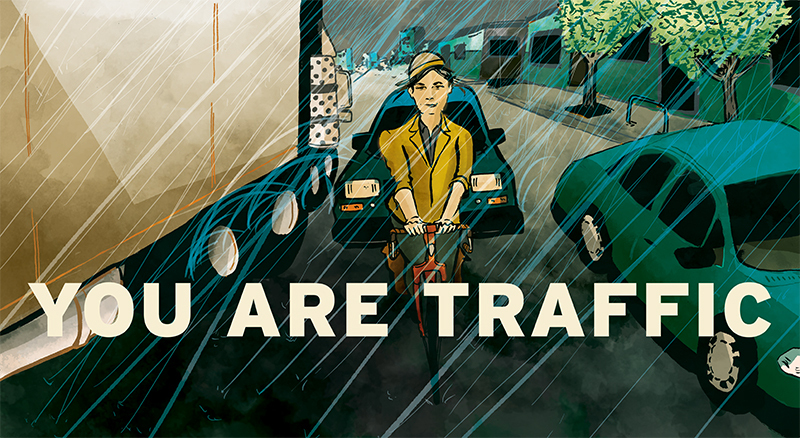 Don’t tell me you’re scared to ride in traffic, you are traffic. Same roads, same rules and all that. It’s not dangerous. Don’t let those safety-patrollers with the rearview mirror sticking out of their helmet fool you, biking down the road is safer than driving and walking combined. You belong on a bike, your bike belongs in the street, period. Also, don’t be scared of your bike, you have time to learn about each other. You don’t need to know what all the parts on it are called to be a serious rider. If you go into the nearest bike shop and some jerk mechanic makes you feel small for not knowing something, go to the next shop down the street, they’re way nicer anyway. Oh, also you’re going to start hosting and organizing group rides. I don’t care if they’re just for the funs or have some form of political goal in mind, we need you to start using your bike as a tool for stitching together more socially connected neighborhoods. Food Not Bombs is a good model. They haul plant-based meals on human powered wheels, and they do it year round and they love it, just like you’re going to. Think food justice. Think street liberation. Or you can team up with any number of the other organized groups out there, check out your local online bike calendar – almost everything happening worth knowing is there, and every bike shop in town has their own bulletin board. Point is, ‘commuting by bike’ is a blast, but not nearly as emotionally rewarding as ‘community by bike’. Meeting new comrades and working for social change with the bicycle as a unifying force will literally change your life forever more. You’re going to love it, and you’re going to love it so damn much you’re never going to let it stop, not even when the rain starts back up next winter. Your city and our Earth thank you. Personal responsibility is the key. Committing to a bold stroke of personal rebellion is the icing on the cake.